Picture - Blackburn Beverley XB287 photographed in 1964. The Blackburn B-101 Beverley was a 1950s British heavy transport aircraft built by Blackburn and General Aircraft and flown by squadrons of Royal Air Force Transport Command from 1957 until 1967. Designed and built by General Aircraft as the GAL.60 Universal Freighter, the first aircraft was dismantled at the Feltham, Middlesex factory and transported to Brough in Yorkshire to have its maiden flight on 20 June 1950. This was followed by a second, the GAL.65, which was modified from the original. Clamshell doors replaced a combination of a door and ramp, and the tailplane boom received seating for 36 passengers. The Bristol Hercules engines became Bristol Centaurus with reverse-pitch propellers, a feature that gave it a short landing length and the ability to reverse under its own power. The take-off run at full load was given as 790 yards, the landing run at full load, 310 yards. 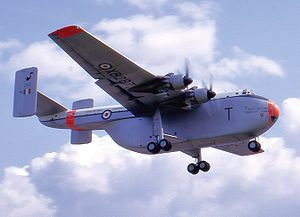 The RAF placed an order in 1952 as the Beverley C.1 (Beverley, Cargo Mark 1). All Beverleys would be built at Brough. The aircraft is a high-wing cantilever monoplane with a fixed undercarriage. The large fuselage has a tailboom fitted with a tailplane with twin fins. The tailboom allowed access to the rear of the fuselage through removable clamshell doors. A 36 ft (11 m) main fuselage space was supplemented by passenger accommodation in the tailboom. The main cargo hold could accommodate 94 troops, with another 36 in the tail-boom. A device called an Elephant's Foot could be fitted under the center of the fuselage just forward of the clamshell doors when it was in use. The foot was held in place by pins inserted through a triangular arrangement of attachment points on the fuselage and was fitted during loading to prevent the Beverley from tipping over when heavy items were loaded into the freight bay. The aircraft was designed for carrying large bulk loads and landing them on rough or imperfect runways, or mere dirt strips. It could trace its design back to the GAL49 Hamilcar glider of the Second World War. When it entered service it was the largest aircraft in the Royal Air Force (RAF). It had a large interior cargo area split into two levels which amounted to around 6,003 ft� (170 m�) of space. Paratroopers in the upper passenger area jumped through a hatch in the base of the boom just in front of the leading edge of the tailplane. The Beverley was equipped with toilets, which were situated in the tail beyond the paratroop doors located on the floor of the tail boom. One fatality was caused by a serviceman who fell twenty feet to the ground when exiting the toilet, unaware that the paratroop doors had been opened. Modifications were made to prevent the toilet doors from being opened when the paratroop doors were open. In total, 49 of the aircraft were produced, with the last one being manufactured in 1958, and final retirement from RAF service was in 1967. The first production aircraft from an original order for 20 from the Royal Air Force flew on 29 January 1955. The first operational aircraft was delivered to 47 Squadron Royal Air Force at RAF Abingdon on 12 March 1956. 53 Squadron, also at RAF Abingdon, received Beverleys in early 1957 but was absorbed into 47 Squadron in June 1963. They were flown until October 1967 when the squadron disbanded. 30 Squadron received its Beverleys in April 1957 at RAF Dishforth subsequently deploying to RAF Eastleigh, Kenya and RAF Muharraq, Bahrain where it disbanded in September 1967. The longest serving Beverleys were in the Far East; 34 Squadron received its aircraft at RAF Seletar in October 1960 and continued flying them until the end of 1967. During this time, 34 Squadron carried out flood relief work in South Vietnam. Prior to this, from June/July 1959, the first four Beverleys to go to the Far East formed the Beverley Flight, 48 Squadron based at RAF Changi. The sixth squadron to fly the Beverley was 84 Squadron at RAF Khormaksar, Aden which flew them from 1958 until August 1967 when they were exchanged for Hawker Siddeley Andovers. Initially, the aircraft were silver overall, but later, those operated by the squadrons based in the Middle East were given an overall sand camouflage finish. XH124 was on display at the RAF Museum London, Hendon. Kept outside, the aircraft deteriorated and was scrapped in 1989. XB261 was on display at the Southend Historic Aviation Museum in 1971. When the museum closed it sat outside for years being weather-beaten and vandalised. It was scrapped in 1989, however, part of its cockpit has been preserved at the Newark Air Museum, Nottinghamshire. XL149 was an instructional airframe after its RAF service and was scrapped in 1977. G.A.L. 60 Universal Freighter : General Aircraft Ltd Designation for the first prototype aircraft. G.A.L. 65 Universal Freighter Mk.2 : Designation for the second prototype aircraft. Blackburn company name B-100. Beverley C.Mk 1 : Medium-range tactical transport aircraft for the RAF. Blackburn company name B-101. Blackburn B-107 : Projected Stage 2 development of the B-101 Beverley designed in 1956 that retained the Beverley wings and tail; and added a completely new rounded fuselage with a larger unobstructed freight hold. The intended powerplants were to be four Rolls-Royce Tyne turboprop engines. The design allowed for 75 paratroops or 108 troops to be carried. The design project never progressed beyond the planning stage. Blackburn B-107A : Projected Stage 3 development of the B-101 Beverley designed in 1959. The B-107A was similar to the B-107 but included main loading doors in the nose and rear doors for para-dropping only, as well as a relocated flight deck. Like the B-107, this project never progressed beyond the planning stage. Nine aircraft were lost in service with the RAF. Two of these were write-offs after explosive damage (1 landmine, 1 bomb). "Beverley Build-up". Flight, 4 February 1955, pp. 145-148. Gladstone, Geoff. The Blackburn Beverley. Newcastle-upon-Tyne, Tyne and Wear, UK: Scoval Publishing, 2010. ISBN 978-1-902236-12-4. Hobson, Chris. Blackburn Beverley C.Mk 1 (Warpaint Mini-Monograph). Alan W. Hall(Publications)Ltd., 1988. ISBN 1-00863-007-X. Jackson, A.J. Blackburn Aircraft Since 1909. London: Putnam Aeronautical Books, 1989. ISBN 0-85177-830-5. Jefford, Wing Commander C.G. RAF Squadrons, a Comprehensive record of the Movement and Equipment of all RAF Squadrons and their Antecedents since 1912. Shrewsbury, Shropshire, UK: Airlife Publishing, 1988 (second edition 2001). ISBN 1-85310-053-6. Overton, Bill. Blackburn Beverley. Hinckley, Leicester, UK: Midland Counties, 1990. ISBN 0-904597-62-8. Blackburn Beverley Pictures and Blackburn Beverley for Sale.